As we reported earlier this month, most motherboard vendors' production schedules seem to indicate a mid-March release of Intel's next enthusiast-level X48 Express chipset. The rumor is that final silicon production is in full swing, and delivery to tier-one partners is occurring for product release in March - just in time for that lull between CeBIT and Computex. Recent delays in the release of X48 have given NVIDIA the breathing room they desperately need in order to prepare their upcoming 790i chipset, so we should see a near-simultaneous launch of the latest Intel based enthusiast offerings. History has shown us that even the smallest setback when it comes to the introduction of products intended to compete with a rival's new offerings can ultimately mean the difference between success and failure in the marketplace. On one hand, NVIDIA knows their SLI technology has won the hearts and minds of a significant share of today's gamers and professional benchmarkers. Because of this, and somewhat against their will, Intel is forced to rely heavily on AMD's ability to positively establish their products as the leader in the high-performance graphics market. In the end, two major factors primarily determine which platform is "best" for the enthusiast: A) Just how well it ends up overclocking the latest processors and memory combinations, and B) graphics cards compatibility, including multi-GPU solutions. In an ideal world, we would be able to make our decision independent of the second point. Unfortunately, this has not been the case for some time now. NVIDIA's reluctance to extend SLI technology licensing to single-socket Intel platforms has resulted in a rather large conflict of interest for gaming enthusiasts worldwide - build around a less-than-stellar overclocking platform with amazing graphics performance, or forgo SLI altogether and concentrate on what we believe is a much more mature solution at this time, which only comes with owning an Intel chipset. However, NVIDIA's day of reckoning is fast approaching. Their failure to open SLI to Intel chipset owners has made them less than popular in some circles, and with Intel just months away from introducing their next big platform interconnection technology (Quick Path), this could prove to be their undoing. Whether or not Intel offers NVIDIA a Quick Path license will effectively determine if NVIDIA's chipset development division will continue business as usual. Additionally, Intel's plans to soon enter the discrete graphics market, coupled with the possibility that NVIDIA may not receive a Quick Path license, may spell the end of SLI as we know it on the Intel platform in the near future. If this scenario plays out, we would all likely be forced into a position where the purchase of a single component would then artificially limit some of the other hardware we could choose in order to complete our system builds. AMD would have their current Spider platform and next generation update, based on the combination of Phenom quad-core processors, AMD 7-series chipsets, and ATI Radeon 3800-4xxx series GPUs running in CrossFire (thanks to their late-2006 acquisition of ATI). Intel would offer next-generation Nehalem/Bloomfield CPUs on Quick Path motherboards, to be paired with one or more of their "Larabee" graphics cards. NVIDIA would be left to offer SLI support for their GPUs with 780/790 chipsets, and beyond that who really knows about the multi-GPU market. Without a doubt, there are interesting times ahead for this section of the market. With Intel's X48 Express chipset launch less than one month away, ASUS has provided us with a near perfect sample of yet another great product for those looking to build their next ultimate overclocking system. Appropriately dubbed the "P5E3 Premium", this motherboard is much more than just a re-spin of their popular P5E3 Deluxe platform with the X48. The temptation for companies like ASUS to merely replace the X38 chipset with the pin-to-pin compatible X48 chipset and then remarket the board under a different name must be great. We would have a hard time giving a nod to the P5E3 Premium if this were the only change, especially to those that already own an X38 board. However, this is hardly the case. Simply looking over the board, we can find very few design layouts common to both the "Deluxe" and "Premium" variants of the P5E3. This is also reflected in the PCB revision silkscreened on the board, which has gone from 1.03G on the P5E3 Deluxe to 2.00G on the P5E3 Premium. Some of the more notable improvements, which we will cover later in more detail, are the use of a 3-phase DDR3 memory power circuit as well as a 2-phase design for the MCH (Northbridge), something we have only previously seen on a few of the as-of-yet unreleased X48 boards from Gigabyte. We cannot say the decision to upgrade these power delivery systems surprises us; overclocking success is much more dependent on clean, reliable power lines than some might realize. Adding additional phases to a power regulation circuit is a great way to reduce the circuit's transient response time. For the user, this means the system is able to tolerate larger, faster total load changes, a crucial requirement in maintaining stability when components are being run well above their rated speeds. In addition, the extra current handling capabilities of the extra pair(s) of MOSFETs help to ensure the circuit does not become overloaded to the point of failure should an enthusiastic user decide to push their board far beyond recommended operating limits. Although not directly marketed towards the extreme gaming crowd, the P5E3 Premium does well in that respect, matching other CrossFire solutions easily. Clearly, however, the focus is on overclocking and features. As with other X48 boards tested in this class, we had no problems running a 400MHz FSB stable overclock at stock MCH voltage (1.25V), which has become our somewhat de-facto test when it comes to judging a new board's worthiness to receive a more in-depth review. ASUS wisely chose to include their new MCH Read Delay adjustment BIOS features with this board, something we explored in detail in our ASUS ROG Rampage Formula review. They have also gone to great lengths to improve their CPU and Northbridge GTL (Gunning Transceiver Logic) tuning circuit implementations. Users now have the ability to tune GTL set points per die using much more precise stepping values (0.005x increments). Now let's take a closer look at the design and layout of this board. Indeed folks. This is the most advanced and powerful board I have ever installed in a computer. I am running Vista Ultimate 64 bit and pushing my E8500 to 4 Ghz per core, much like in the testing. 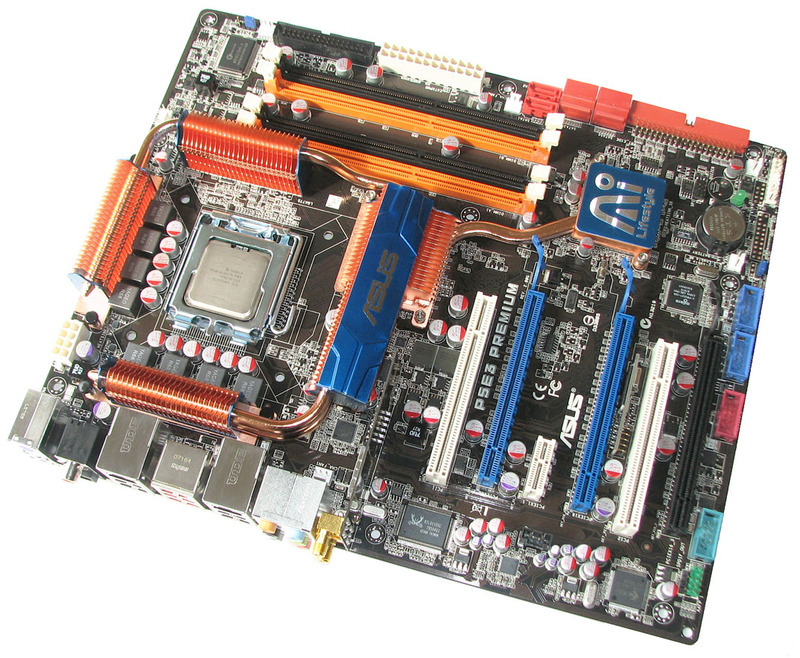 I can't begin to tell you how fast this motherboard with the E8500 is. For overclockers ... this is the board they have been waiting for. Period! I purchased this board with 2x1GB sticks of OCZ DDR3 1800 memory to use with my e8400 CPU (which I can get stable to at least 4050mhz on other mobos). What RAM did you use for this testing? I can't even come close to running stable at the settings you have listed, nor can I score any higher than about 11,500MB/sec read and 46ns with everest benchmark, and the settings I used to achieve those values are very unstable. And 1N memory settings??? This board won't even post if I set the memory to 1N running the memory over 1333mhz. Just wondering if you could share the RAM brand you used along with your motherboard and RAM voltage settings to achieve such a feat. "With an estimated retail price of around $299, there is a lot of value in the purchase of the P5E3 Premium for those looking at a high-end motherboard to use in the coming years." Great review! I have been reading alot here att anandtech and generally all over the web preparing my first ever pc-build. Intel seem to be the way to go. The DDR3 power circuit is different to the one here att anandtech. Still it claims to be the same board. At least so it seems to me. A couple of other sites have the same pics with different power circuits. Are there different versions of the P5E3 PREMIUM/WIFI-AP@N in circulation? If so, how do i tell them apart before buying? Hi Kris. Very nice view for the mobo. As you have been practicing and analizing a lot on how doe sthe GTL reference voltage works, which settings for CPU and NB on GTL did you used for 550 FSB? Also, which voltage should you consider to be the max for 24/7 situations? Around 1.4v? If we had to do an analogy, between conroe and Wolfdale, when Conroe max voltage for 24/7 was around 1.5-1.6volts, on that time, being 1.3v the stock aprox. Now, with Wolfdale, 1.125v is about the common VID, so, which would be the voltage limit for 24/7? Maybe I missed the system specs. I can see the proc in the CPU-z shots, but I'm really curious what RAM you used for this test. Even though I know the MB is critical for getting this kind of performance out of the RAM, not mentioning which one you use seems to imply that you can get these results with any decent DDR3 RAM. Is that so?